A Contractor Took My Money and Never Came Back. Isn't That Illegal? Home » The Law & You » A Contractor Took My Money and Never Came Back. Isn’t That Illegal? A Contractor Took My Money and Never Came Back. Isn’t That Illegal? A viewer entered into a contract with a contractor to fix his roof. Although the contractor took his deposit, he has yet to return. Is this a crime? Find out. 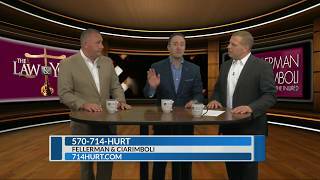 Dave Kuharchik: We’re talking about a contractor issue in this edition of “The Law & You.” The virtual law center is back. So are attorneys Greg Fellerman and Ed Ciarimboli. Always great to see you guys. Ed Ciarimboli: Is this heat ever going to stop? Dave: I think it’s supposed to rain. Ed: Or the rain. Or the humidity. Dave: I don’t think it’s going to be humid for very much longer. Ed: Man, I’m not built for this. Dave: Sooner or later, it’s going to change. We’ll get there eventually, I suppose. In the meantime, we’ll tackle our question tonight. Harry in Scranton says, “I recently entered into a contract for a contractor to repair my roof. The contractor took a deposit and never returned. Is this a crime?” So it looks like Harry’s money was taken and no services provided. Ed: Harry, it is a crime. Call the authorities, report it. Especially considering the amount of the deposit he took. The law has changed substantially over the years. They’re scams. I mean, it’s a total scam. Contractors taking your money, promising they’re going to do the work. They never do the work. It’s an outright theft. Yes, it is a crime. Yes, you need to report them. Greg Fellerman: And if you remember, we talked about this for years. And the legislators backed it and created a new law that specifically addresses this and fits right within the parameters of what happened to these contractor fraud cases. So, the criminal aspect is one and obviously, you have the right to civil remedy. Also, you can sue them and try to recover your funds both ways, which is not a bad way to keep the pressure on these contractors to do that stuff. But, it’s a terrible situation. We see a lot of it. Ed: Too much of it. We see way too much of it. Dave: Those that need to call and talk to you guys and maybe get some legal advice or direction, how can they reach you? Greg: Give us a call — 570-714-HURT. See us on the web 714HURT.com. Social media, Instagram, we’re everywhere at this point. Greg and Ed: Home Depot. Dave: The gym, the lake. Dave: Results matter. Attorneys Greg Fellerman and Ed Ciarimboli, guys thanks so much.